Tonight I am going to tell you about this awesome event that I attended last Sunday at The Old School Club near Battersea Arts Centre with Currys. 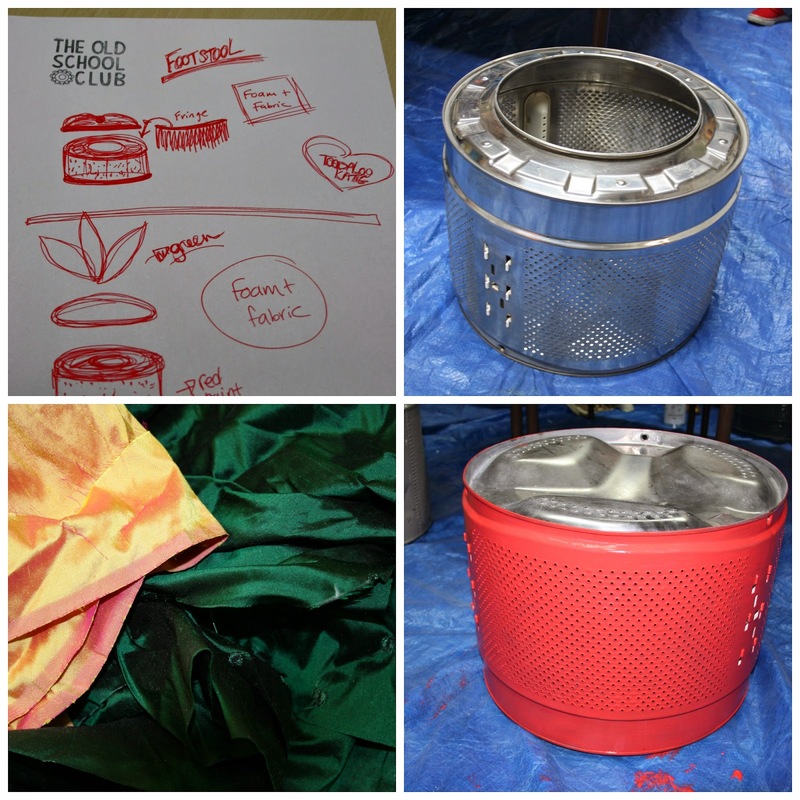 It was an upcycling workshop where a group of about 15 bloggers attended and made different projects using old washing machine drums supplied by Currys. 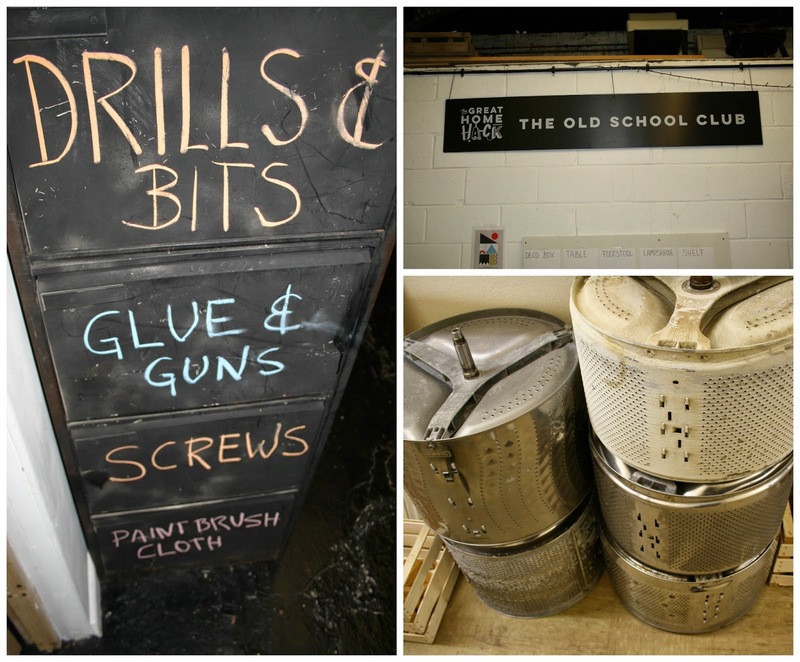 The lovely people of the Old School Club had pre-cleaned them and had them ready for our various projects. We had the option of turning our drums into shelves, decorative storage boxes, tables, lampshades and footstools - and I chose a footstool. I will start out by saying that I have always loved crafting and DIY and it was a love that I had to leave behind when I left Canada, simply because of space, time and all of my supplies being so far away. It was a really nice feeling to get back into my crafty zone and properly upcycle something that would have headed for a landfill without my creativity. As soon as I saw the silver drum, I knew what I wanted to do. The cheese grater-like outside of the drums made me think that once painted it might look like the seeded texture of a strawberry (with the use of your imagination of course). So I thought that if I could find the right colour of paint and fabric, it could all come together in a cute and shabby chic kind of way. I did a quick sketch of my idea along with a backup one in case none of my wishes came true in the paint and upholstery department. 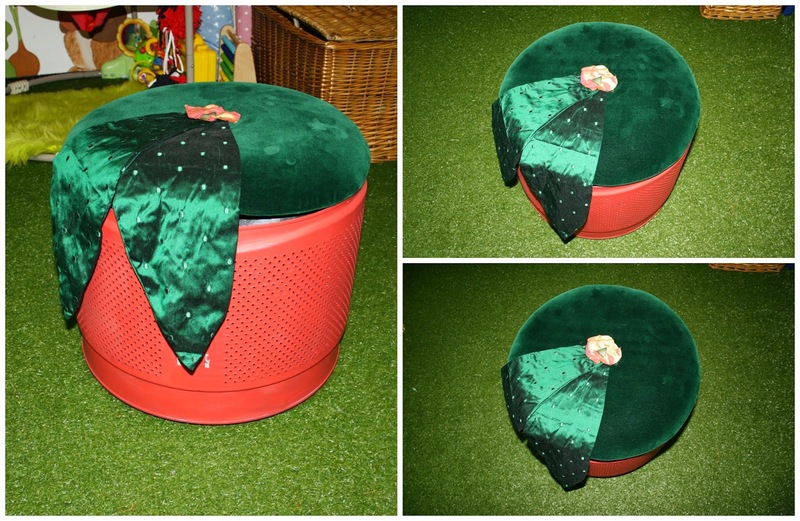 To say that all my crafty wishes came true was an understatement - green velvet fabric with spotted taffeta, red paint and even a triangle button to top it all off, were waiting in the various areas. I set to work giving the drum a quick coat of strawberry red paint, aiming not to fill the holes with paint and keep the spotty texture there. 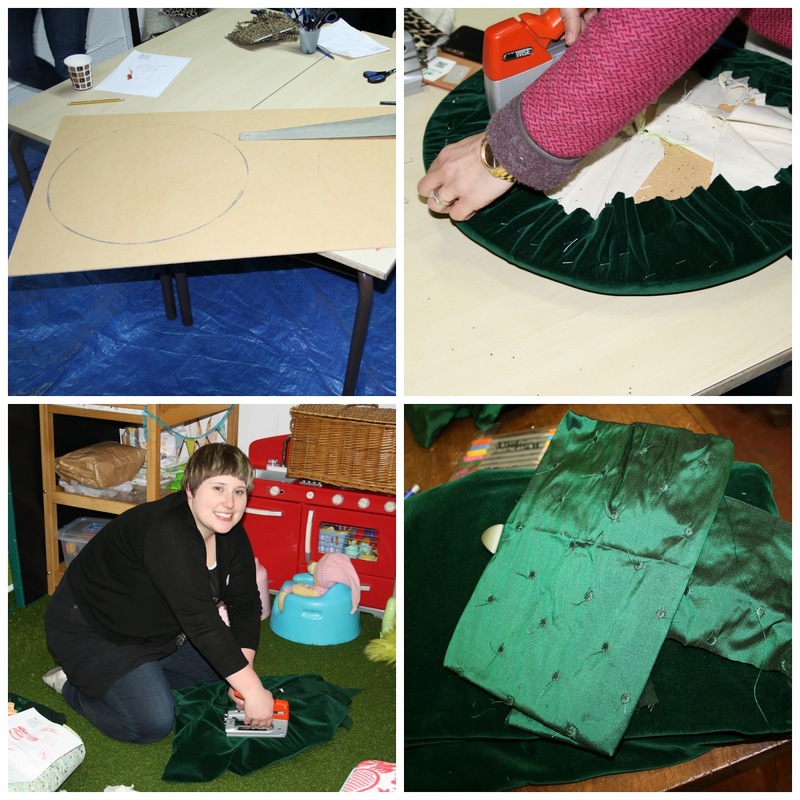 Next, we were shown how to cut the circle for the seat out of chipboard, including a matching foam round and began the endless task of stapling calico and velvet to the seat. I was rushing like a madwoman because we were short on time and I was determined to not only finish the drum but also add extra strawberry leaves - which I had to still had to make. I could hardly believe that on top of finding lovely green velvet, there was also a small piece of green taffeta fabric with sort of notches of thread - I could not have found a better scrap to make my leaves with. I free handed the leaf shape with scissors, in my haste to get them done and sewed them inside out - leaving a hole at the bottom to flip them back through. With the rough bottom edges, I tucked them under and used a piece of peach coloured taffeta to hide the handy work before attaching the button. And voila! Here is the final product - it was a complete coincidence that the room had astro turf flooring - making all my photos look like it was in a garden - in a sort of Willy Wonka-esque kind of way. I had so much fun meeting other bloggers on the day and really getting stuck in to a project that was so different from anything I had ever done before. It really makes me think about how much I throw away and the value of taking a second look at items that you think have had their time. I took my stool home and am now actually using it as a little seat for my small blogging desk/corner where I write and prep posts. One day when it's all done and pretty I will share my space with you all. Have you ever done an awesome upcycling project before? Tell me about it in the comments or share photos on Twitter or Instagram! Also, be sure to search #UpcycleWithCurrys to see all the other amazing projects! Team Footstool, as we called ourselves, was Tinuke from Circus Mums on the left, myself and Sam from Honey Go Lightley on the right!